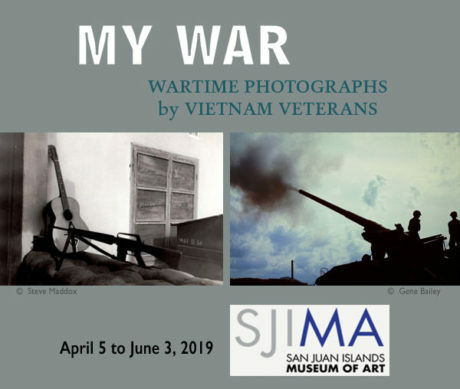 The San Juan Islands Museum of Art (SJIMA) presents a visually arresting and powerful first-person history of pictures taken from the inside looking out- April 5 to June 3, 2019. Some servicemen in Vietnam made pictures when they had time. Those lucky enough to afford both a camera and film used their tools with visual acuity, and in many cases, a high degree of skill. The camera enabled them to create a parallel war experience where they had a modicum of control by choosing what to photograph – simple scenes evoking memories of home, gestures of lighthearted camaraderie, and the endless protocol and efficiency of war. Taking pictures became a way to engage and remember local strangers. The camera also helped put the soldiers’ war experience into context, such as their understanding of the implications of an F-100 Super Sabre flying off into the dawn sky. Many of the photographs in “MY WAR” capture the in-between moments. In some cases, in between a friend’s life and death, in between bombing runs or ground offensives, in between here and there, on the road, in wakeful waiting, worrying and hoping, caught in the tedium of teamwork and down moments while ticking away time.